Experience the energy of Madrid at night on a pub crawl with party-loving guides and an up-for-fun crowd. 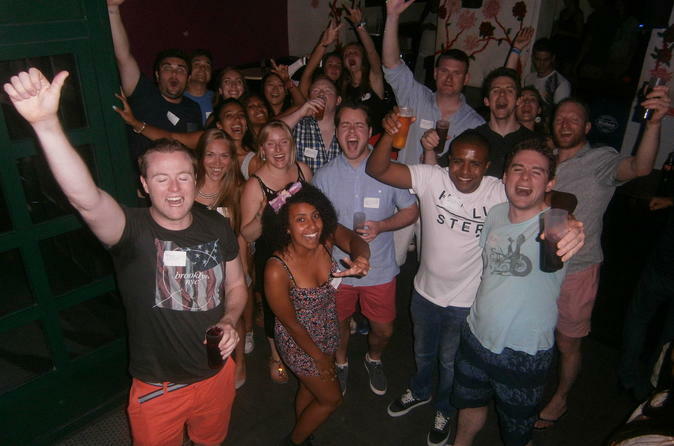 Explore the city's nightlife alongside a cool group of backpackers, travelers or people just looking for a good time, and go to some of Madrid best bars and clubs. Upgrade your ticket to include a private guide, exclusive to just your group. Meet your guide in central Madrid for this high-energy walk around Madrid at night, visiting some of the city’s best bars and nightlife venues. In this tour you don't have to go looking for the coolest places to go out at night in Madrid, as your guide will do that for you! If you are new in Madrid, you will quickly realize that there is an abundance of bars and clubs in the beautiful city, undoubtedly many more than in most capitals. The staff aims to please by taking you to a variety of bars, centered around Sol, the nightlife heart of the city. Each provides a different atmosphere, with a distinct Spanish or western style. On your pub crawl experience, you will get a free shot at each bar, which varies from week to week. However, tequila is always on the menu! You will also enjoy exclusive discounts on drinks at every bar, and free entry to one of Madrid’s hottest clubs at the end of the night. Upgrade to a private tour to keep the night's festivities exclusive to just your own group.